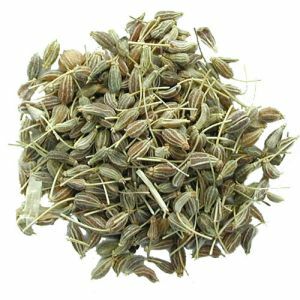 Pimpinella anisum, also called aniseed, is a flowering plant in the family Apiaceae native to the eastern Mediterranean region and Southwest Asia. Its flavor has similarities with some other spices, such as star anise, fennel, and liquorice. Anise plants grow best in light, fertile, well drained soil. The seeds should be planted as soon as the ground warms up in spring. Because the plants have a taproot, they do not transplant well after being established, so they should be started either in their final location or transplanted while the seedlings are still small. In foods, anise is used as a flavoring agent. It has a sweet, aromatic taste that resembles the taste of black licorice. It is commonly used in alcohols and liqueurs, such as anisette and ouzo. Anise is also used in dairy products, gelatins, meats, candies, and breath fresheners. There are chemicals in anise that may have estrogen-like effects. Chemicals in anise may also act as insecticides. The essential oils present in aniseed make it an ideal cure for flatulence and to remove phlegm and catarrh in the bronchial passageways. Boil water and add a teaspoon of aniseed to it. Leave this to infuse overnight. Strain and drink first thing in the morning with a little bit of honey. This cures indigestion and stomach pain. Aniseed causes the body to perspire more and encourages urination thereby helping the body to detoxify by eliminating waste. When taken twice a day (morning and night) over a sustained period of time, aniseed powder can reduce cataract in the eyes. The expectorant property of this herbs helps relieve asthma symptoms. Aniseed tea made by boiling water and steeping aniseed in it is an excellent cure for insomnia. To make it more palatable, you can add either honey or hot milk. Have this before going to bed for a sound night’s sleep. The fungicidal properties of aniseed can help get rid of and prevent head lice. The anethole present in aniseed essential oil improves the production of breast milk. Aniseed can also be used as a mouth freshener.